The most common use of asbestos in our homes or business is in asbestos cement sheeting. Asbestos cement looks like most other cement based products. It is a mid-grey colour when in good condition. It is harder than gyproc or plaster so is less flexible and harder to penetrate than those other materials. It was widely used in Australian homes during the 60’s 70’s 80’ and even early 90’s! We have seen houses as late as 1993 with asbestos wet area walls such as bathroom, laundry or toilet walls It is VERY common in your outside eave linings and carport ceilings too. Asbestos cement walls sheeting is typically between 3 and 6mm thick, it often has a stippled pattern on the back and is smooth and flat on the front. Please refer to our website (https://asbestosremoval.com.au/ ) or Facebook (https://www.facebook.com/asbestosremoval.com.au/ ) for pictures of asbestos cement from our removal work. Asbestos was also used in “Deep Six” corrugated cement roof sheets. These will often attract moss and lichen over the years and will look a little dirty/grubby. The sheets are around 6mm thick and have a wider corrugation than typical corrugated iron. They are very heavy and can crack if walked on by inexperienced people. DO NOT walk on an asbestos cement roof if it has ANY moisture on it at all. The moss/lichen become as slippery as wet tiled flooring when moist/wet and you will most likely fall off the roof! 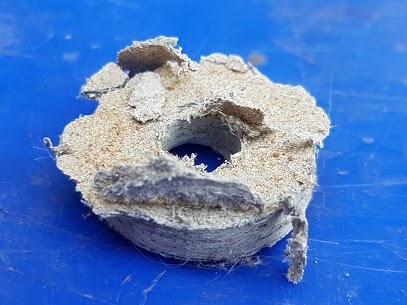 An easy way to check BEFORE you mess with a suspected asbestos containing material is to carefully unscrew and remove a power point, ceiling van or wall vent so you can see the edge of the material. If it fits the parameters above DO NOT proceed with any work. Contact us at South Adelaide Asbestos Removal to arrange a quick quote or asbestos test. Remember, the ONLY conclusive way to identify asbestos containing materials is to have it tested under a microscope. If someone tells you different run (don’t walk) in the opposite direction!